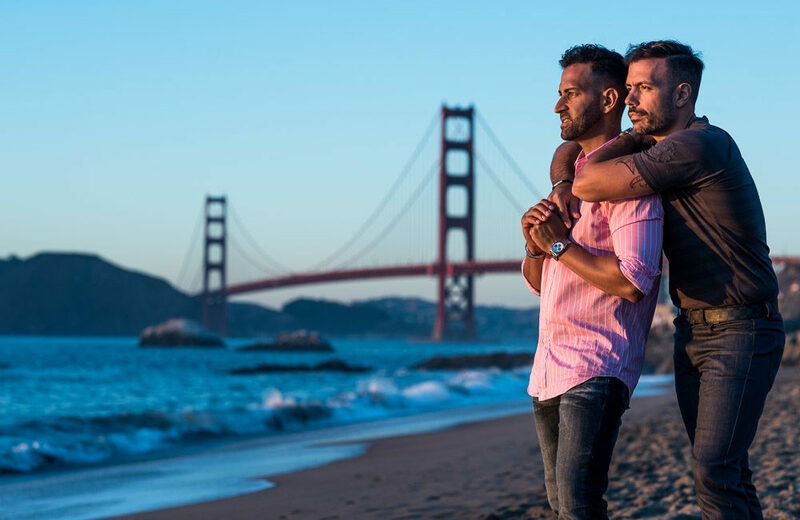 While Juan and Rigo might have only been visiting San Francisco for the weekend, they look completely at home in this beachy engagement session. Maybe that’s because they currently live in Florida. Until they arrived in the city it had been cold and cloudy, so I’m convinced they brought the sunshine and beach vibes with them to California. We started out their engagement session in downtown San Francisco near Union Square. I’m a big fan of spending a bit of time in the city, since the backgrounds are so varied and the light is so great even in the middle of the day. Then we headed to Baker Beach for some sunset photos, where we got really lucky with the light. If I were a landscape photographer I would have been pretty bummed out that there were no clouds in the sky. Fortunately, I photograph people, so it was amazing for photos of two people who are in love! Christine and Josh Got Married!